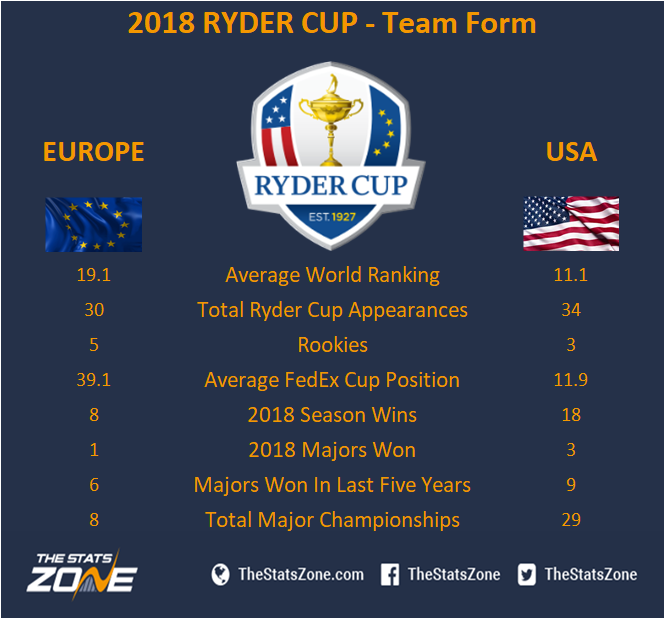 What is the format of the 42nd Ryder Cup? Play commences on the morning of Friday the 28th with four foursomes (alternate shots) matches followed by four fourball (better ball) matches with the same structure being repeated on day two. The final day sees each player compete in 12 singles matches with a total of 28 points available over the three days. 14 ½ points are required to win the Ryder Cup and 14 points needed to defend for the USA. Since the Ryder Cup became Europe rather than GB&I in 1979, Europe has won 10 compared to USA’s eight with there being just one draw between the two teams. Team USA have a notable advantage over the Europeans when it comes to form, with over double the amount of tournaments and majors won this season. Furthermore, the Europeans finished an average position of 39th in the FedEx Cup compared to the Americans who on average finished 11th - whereby Jordan Speith was the only player not to make it to the season-ending Tour Championship at East Lake. Additionally, they have two fewer rookies competing this week and amass four further Ryder Cup appearances within their team. Team USA’s advantage in total majors won is of course significantly inflated by the 14 titles belonging to Tiger Woods. Team USA team are ranked, on average, 11.1 in the world, with the Europeans ranked 19.1. 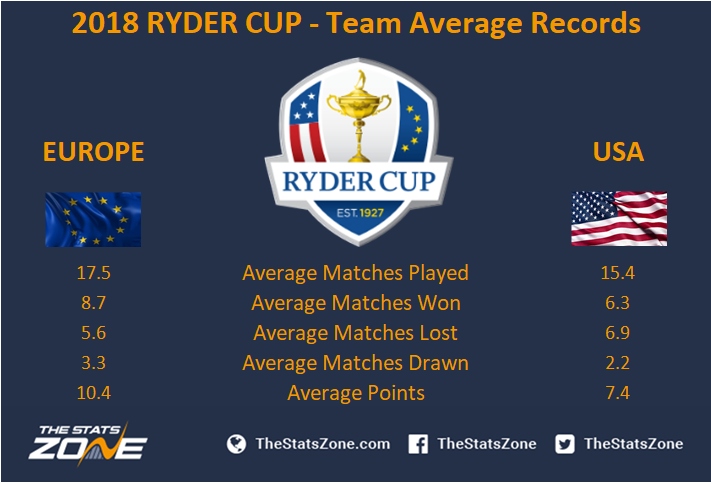 Although Team USA hold the advantage in this respect, it is not by a hugely significant margin and so the 2018 Ryder Cup is unlikely to be a one-sided affair with the world’s very best showing their skills. 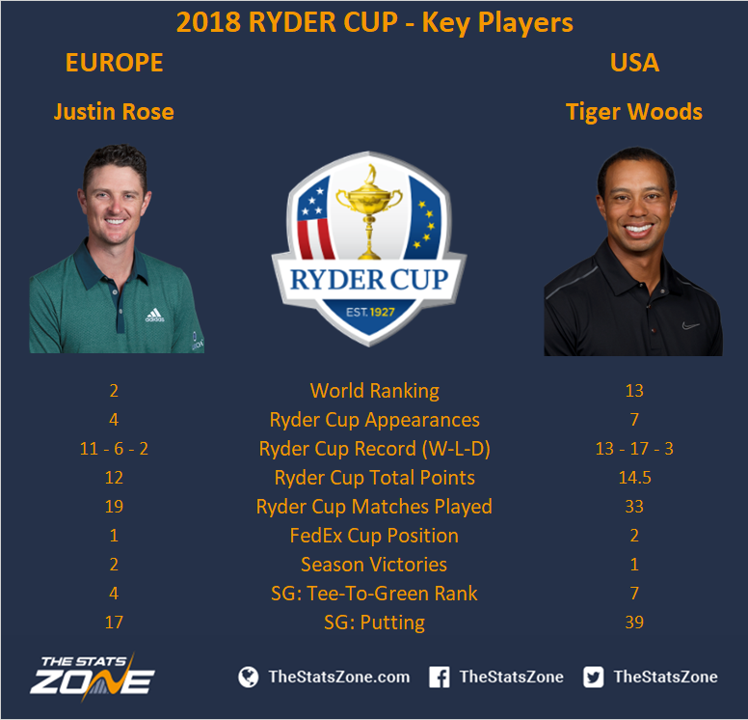 With Europe dominating the Ryder Cup over the last 18 years – winning six and losing just twice – many of their stalwart players in Sergio Garcia, Ian Poulter, Henrik Stenson, Justin Rose and Rory McIlroy sees the teams overall average points won at 10.4 compared to USAs 7.4. Furthermore, Europe average nearly two matches played per player more than USA, showing that the European captains have used their big name players the most. Strokes gained tee-to-green and putting were assessed for the player’s respective seasons. 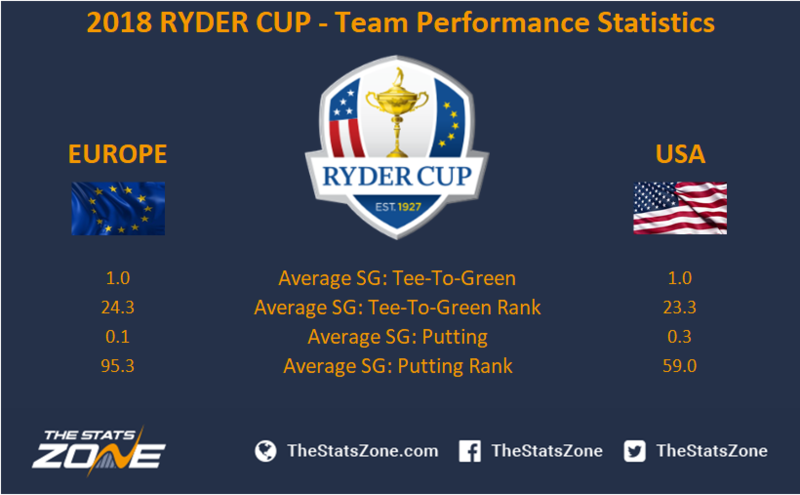 On average, Team Europe rank just one place higher than Team USA for SG: tee-to-green, but both gained a stroke per round with their long games, demonstrating that some of the very best and most exciting exhibitors of ball-striking will be on show this week. However, Team USA rank much higher in SG: putting (59 vs 95.3) and claim 0.2 shots per round more than their opposition. With the Americans having players who putt better and with there being little to choose between the players’ long game, expect the greens to be slightly slower this week to try and reduce the Americans’ main strength and increase their own chances of winning. Europe’s key player this week is world number two and current FedEx Cup champion Justin Rose. As the world’s most consistent player over the last 18 months, the Englishman knows how to rise to the occasion in recent Ryder Cups. With a 58% win record from 19 matches and a game high on form and confidence, he’ll be looking to lead his team from the front. The fact that Tiger Woods has even made the team is quite remarkable and would have been unconceivable this time last year. Having claimed his 80th professional win and first in five years at last week’s Tour Championship, not only is Woods back to near his best, but he also brings a support that has not been seen in the game for many a year. With a 44% win record in Ryder Cups, which he’ll be desperate to improve, he could be a vital player this week for the Americans. In summary, there is very little to choose between the two teams on paper. This is arguably the strongest team – in terms of world ranking at least – that either team have had. Team USA possess players who are perhaps in a little better form from the FedEx Cup Playoffs, but for this exact reason, they may have had less preparation time compared to some of the others, which is where experience will come into play. With eight rookies competing this week – of whom all are big name players in their own right – anticipate them to play a very important role for both teams. One thing is certain; this will be an extremely competitive and closely fought contest which makes it truly one of the greatest sporting events in the world.